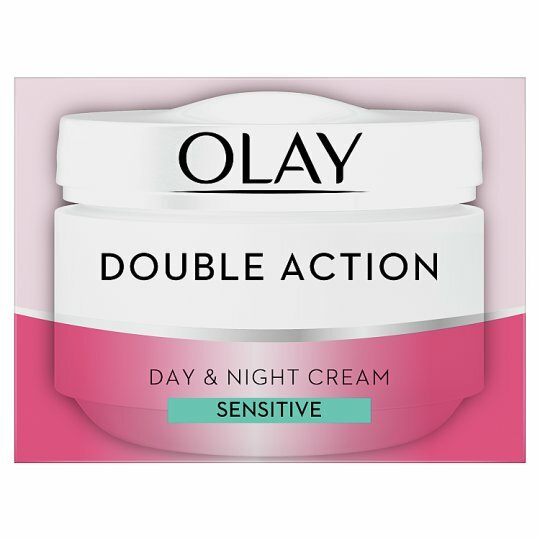 Enjoy 24 hours of daily hydration with Olay Double Action day cream for sensitive skin. This anti ageing cream nourishes and regenerates your skin's appearance. It provides nourishing hydration and moisture lock protection and is specifically formulated to care for your sensitive skin. Its fragrance-free and colour-free non-greasy formula is quickly absorbed into the skin, without leaving a greasy layer. Olay is about beauty, inside and out. Aqua, Ethylhexyl Methoxycinnamate, Glycerin, Cetyl Alcohol, Petrolatum, Cyclopentasiloxane, Stearyl Alcohol, Isopropyl Palmitate, Dimethicone, PEG/PPG-18/18 Dimethicone, Carbomer, PEG-100 Stearate, Myristyl Alcohol, Arachidyl Alcohol, Stearic Acid, Palmitic Acid, Myristic Acid, Methylparaben, Propylparaben, Imidazolidinyl Urea, Titanium Dioxide, EDTA, Sodium Hydroxide, BHT.